When I arrived on the San Carlos Apache Reservation to begin work as an educator, I lived in teacher housing in downtown San Carlos. I was often told Peridot (pronounced phonetically, with a hard ‘t’) was the best nearby town to do my shopping and run errands. My brain did a double take because I wanted to correct everyone and say, “You know it’s pronounced Peridot, right?” with the ‘dot’ pronounced as ‘doh.’ Let me tell you, am glad I never said what I was thinking out loud. Trying to fit into a new community is everything to a newcomer and in Gila County everyone knows you’re from out of town if you pronounce Peridot incorrectly, so of course I started pronouncing it just like the locals. Living in the area for over ten years now, I’ve learned quite a bit about the gemstone the town is named for. Peridot is a semi-precious, dazzling gemstone; it is produced for the market in three forms, and a substantial quantity of it, treasured the world over, comes directly from Peridot, Arizona on the San Carlos Apache Reservation. Many people know that Peridot is the August birthstone; unless you’re a geologist, or work at the Pickle Barrel Trading Post, you might not know that Peridot is actually the gem form of Olivine and is one of the few gemstones that only comes in one color. This semi-precious gem comes in various shades of green, however, ranging from lavish lime to autumnal green. The shade of green actually has to do with the amount of iron in the crystal structure of the gemstone: the more iron, the deeper the hue. No matter the coloration, Peridot is a fantastic gem for all jewelry settings. As if that doesn’t make Peridot special enough, it is one of two gemstones, the other being diamonds, which are not formed in the Earth’s crust but in the magma of the Earth’s mantle. To translate, that means it is only brought to the surface by volcanic lava. Peridot is literally born of fire and is therefore mined laboriously by hand. Another unique property of Peridot is its availability in three forms– raw, tumbled, or facet-cut. In its natural raw form, it’s found in black basalt, but Peridot is unique because it can be tumbled into beads and cabochons. The smaller beads are often strung together to make necklaces and earrings. The bigger cabochons are used in pendants, rings, and bracelets set in bright silver or gold. Most notably, it can be facet-cut and the gem will glitter like an emerald. The Egyptian ruler Cleopatra had an abundant emerald collection which many historians now believe were actually Peridot jewels. The Shrine of Three Holy Kings in Cologne, Germany is covered in hundreds of brilliant stones, including many green ones, which for centuries were thought to be emeralds. They are actually Peridot. Not only does Peridot jewelry date to ancient times, it is still featured and admired in contemporary and Native American jewelry designs. This gemstone definitely has many purposes, all of which feature that gorgeous green color. For me, one of the most interesting facts concerning Peridot is this: the San Carlos Apache Reservation produces the majority of the world’s supply. 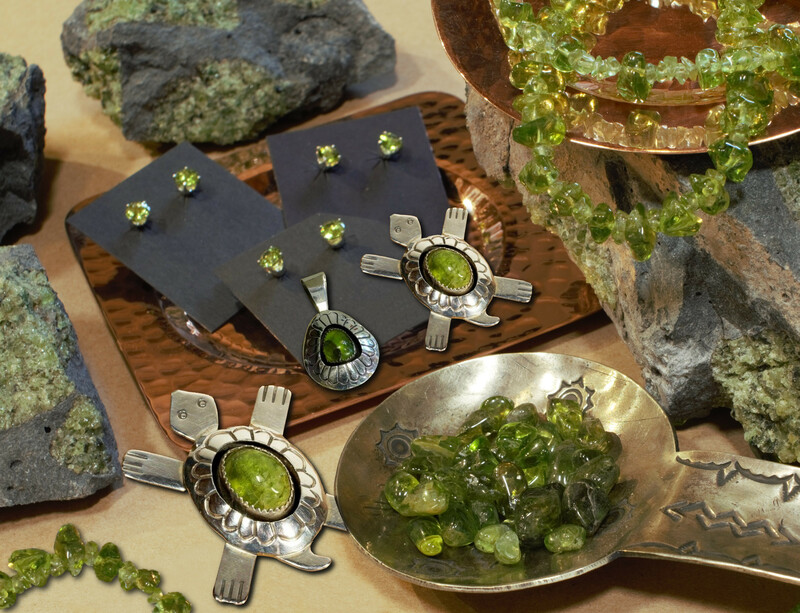 A few miles from the small town of Peridot, Arizona, sits the Peridot Mesa where the gemstone is mined. Arizona is known for its mineral and gemstone bounty, but it’s unique that 85% of the Peridot in the world is mined locally in Gila County. Peridot gemstones have always been around the San Carlos Reservation, but it wasn’t until the 1990’s that someone recognized the rarity and simultaneous abundance that was specifically located around a basalt-covered mesa along US Highway 70. San Carlos Apache tribal members are the only people allowed to mine for Peridot, and with nothing but pickaxes and hammers, they slowly and carefully extract jewelry-grade stones. Many take the gemstones home, tumble them, and create lovely pieces of Peridot jewelry which are sold locally; others sell the raw stones to other jewelry designers or rock shops. The San Carlos Apache people have compelling cultural traditions and natural resources; it’s not surprising their land also holds large deposits of the hypnotic Peridot gemstones. So what have we learned about Peridot today? We know much of it comes exclusively from the San Carlos Apache Reservation and is one of the few gemstones that comes in only one color. We also know that Peridot can be sold in its natural form, tumbled into beads, or facet-cut; but most importantly, you can find it in all of these forms at the Pickle Barrel Trading Post. 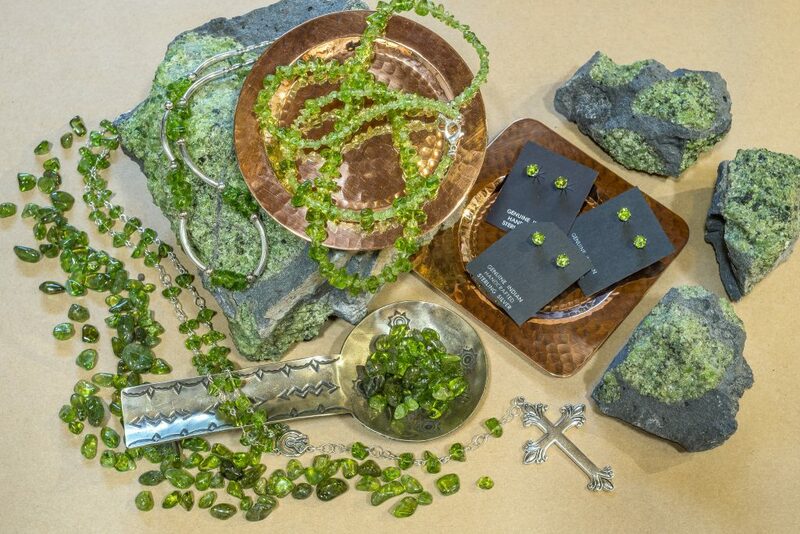 We feature Peridot in all shapes and sizes, from a chunk of basalt housing raw stones to alluring jewelry featuring that gorgeous green color. All of our Peridot, whether set in simple post earrings or glamorous rings, comes directly from Peridot, Arizona, located just 20 miles east of us, on the Apache Reservation. Next time you find yourself in Globe, Arizona, stop by the Pickle Barrel Trading Post and browse through all we have to offer. You won’t be disappointed. However you pronounce ‘Peridot’, we’ll be happy to show you what’s on hand!